Few outside the Mormon religion take the Book of Mormon seriously these days. By ‘Book of Mormon’ I mean the sacred texts of the Latter-Day Saint (LDS) movement that chronicle the lost history of the Americas from approximately 3000 BCE to AD 421. 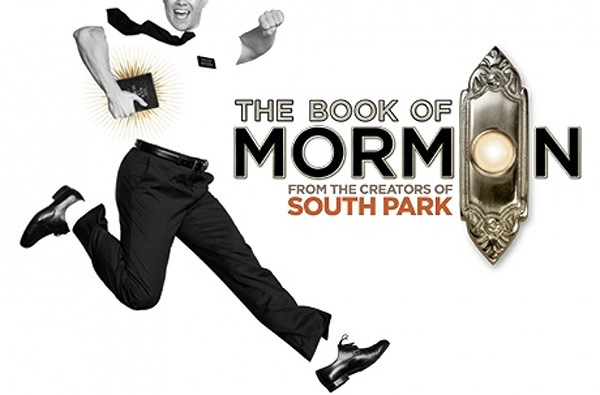 Today, indifference for Mormonism has been replaced by mockery, thanks to the musical The Book of Mormon, written by the creators of the popular television series, South Park. The show opened on Broadway in 2011, winning countless awards and becoming the fastest-selling Broadway-cast album in iTunes history. However, what if there were more to the Book of Mormon than the disparaging musical would lead you to believe? What if its peculiar story provided insight into some of the most confounding conundrums in history? Any examination of the Book of Mormon must commence with Joseph Smith, the ‘modern-day’ author of the work, whose alleged rapport with an angelic being led to his discovery and translation of a series of gold tablets, which had been hidden in a stone box and concealed within a sacred hill in New York State for over a thousand years. Joseph Smith (1805–1844) was known as the ‘Great American Prophet’, a grandiose but deserved title, given that he founded Mormonism, which launched the Latter-Day Saint movement, a theology that boasts over 15 million congregants. Smith’s religious fascinations seemed predestined, for at the age of twelve his family moved from Vermont to the ‘burned-over’ district of western New York, an area famous for its religious fanaticism. As an impressionable young man, Smith grew up during the Second Great Awakening, a nineteenth-century Protestant revival that had grown out of the First Great Awakening of the 1730s and 1740s, a spiritual movement that galvanised followers on both sides of the Atlantic, but which was especially popular amongst the American colonies. 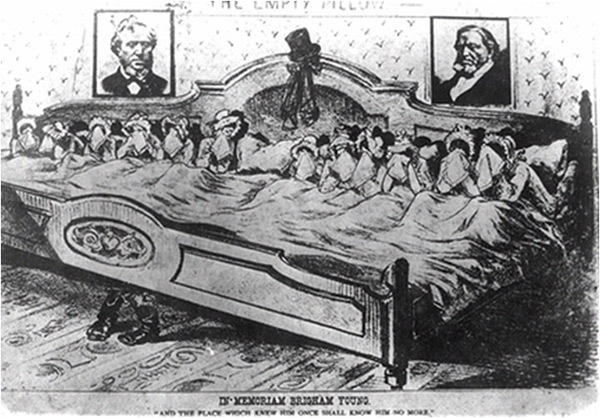 By the 1820s the Second Great Awakening was approaching its peak, fuelled by a unique blend of romanticism that employed an emotional appeal to the supernatural. Smith and his family struggled, and their hardship worsened when his older brother, the family’s principal provider, died in 1823. Smith had no choice but to take on various odd jobs, including the dubious vocation of treasure hunter. Not surprisingly, Smith incorporated a high degree of supernaturalism in his work. He excelled at the job and learned to effectively incorporate divination devices or (as some would say) props, such as looking into a seer stone for sight. It was during this period that Smith, just seventeen years of age, encountered the angel Moroni, who appeared to him in a vision and informed Smith of the existence of the golden plates. Moroni revealed that long ago, when he was mortal (a prophet, but not yet an angel), he had been the last to chronicle the epic journey of ancient Mesopotamian tribes to America, a destination that was prophesied as the ‘Promised Land’. 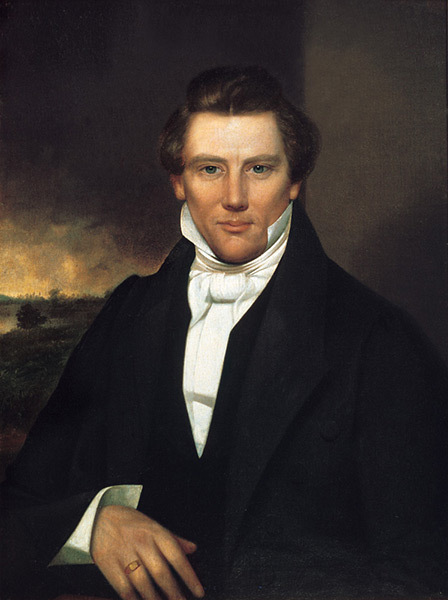 Smith would have several encounters with the angel Moroni, most famously in 1823, on the evening of 21 September, when he informed Smith that the following day (the autumn equinox) he would receive divine guidance as to the location of the golden plates. 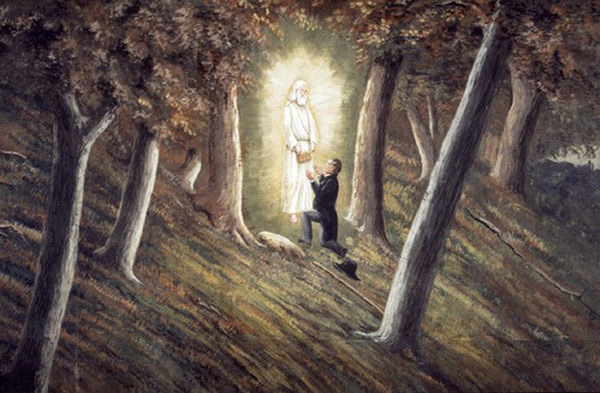 The next day, the angel Moroni appeared and instructed Smith to meet him at the same place, only on 22 September of the following year, at which time he would receive further instructions. The angel Moroni stipulated that in exactly four years’ time Smith would start the translation of the golden tablets, a process that Smith called ‘bringing them forth’. Time passed and after failing to find lost treasure for a wealthy patron in Chenango County, New York, Smith was brought before a local County court in 1826, accused of ‘glass-looking’, or playacting, that is, pretending to find lost treasure via divination. Still, such setbacks would not deter the indomitable entrepreneur from establishing his legacy and amassing his fortune. The following year, in 1827, Smith married Emma Hale and the newlyweds moved in with his parents in Manchester, New York. Smith’s father-in-law, Isaac Hale, disapproved of Smith’s ‘money-digging’ vocation and attempted to set the ambitious young man up in business. In exchange for abandoning his controversial vocation, Hale promised accommodation for the couple on his property in Harmony, Pennsylvania. Later that year the newlyweds took him up on his offer. Under strict orders from the angel Moroni, Smith vowed not to show the tablets to anyone. In keeping with the angel’s wishes, Smith secured them in a locked chest for safekeeping. Nevertheless, word of Smith’s discovery spread quickly and members of his former treasure-hunting company attempted to steal the golden tablets, and even resorted to violence and trickery to try and obtain them. Wisely, Smith departed his home for a safer abode in which to translate the golden tablets. Q. Had he [Joseph Smith] not a book or manuscript from which he read or dictated to you? The plates often lay on the table without any attempt at concealment, wrapped in a small linen table cloth, which I had given him to fold them in. I once felt of the plates as they thus lay on the table, tracing their outline and shape. They seemed to be pliable like thick paper, and would rustle with a metallic sound when the edges were moved by the thumb, as one does sometimes thumb the edges of a book. As integral as Emma was to the translation process, in early 1828, in an attempt to expedite the rather laborious task, Smith employed his first scribe, a man by the name of Martin Harris, and their collaboration would be problematic, to say the least. After some months Harris took a sample of the scrolls to Charles Anthon (1797–1867), a local and respected scholar, who tried to persuade Harris that the golden plates were a hoax. Nevertheless, Harris’s account of the meeting was somewhat different to that of Anthon. Harris insisted that Anthon accredited the writing, before Anthon learned that the texts had come from an angel, at which point he wanted no part of it. Word of Anthon’s dis-accreditation spread, but that was the least of Smith’s worries. Soon after the Anthon affair Harris travelled to Palmyra for further scholarly analysis, prompted by his wife’s skepticism of the whole affair, with the sole copy of the 116-page manuscript. Suspiciously, Harris ‘lost’ the entire transcript. Tragically, Smith’s problems became even worse, when around this time his wife gave birth to a son, who died the same day. 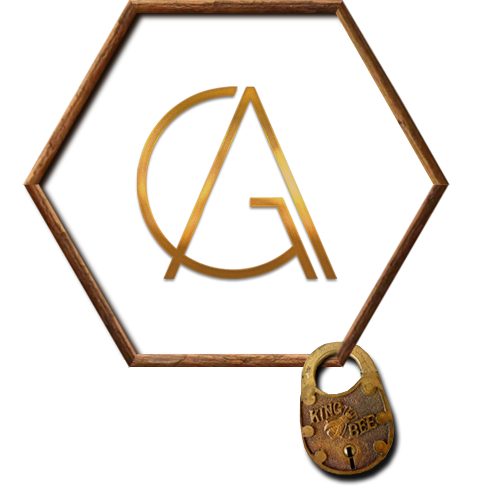 Smith, despondent at the loss of his son, reported that the angels had intervened once more, only this time they had taken the golden plates back, and thus there was nothing left to translate. Smith was in a fragile state. As part of his mourning he attended Methodist meetings with his wife Emma until her cousin objected to a ‘practising necromancer’ frequenting the church. To be fair, Smith was controversial, and even practised polygamy. Needless to say, he was not popular in certain households, as one can imagine. The reference to the ‘Urim and Thummim’ is interesting, for Smith mentions them and the seer stone interchangeably at times, when in fact they perform different functions. LDS scholars believe that the Urim and Thummim refer to ‘two stones in silver bows’ that were attached to a breastplate which had been buried in the stone box that the angel Moroni had hidden in Cumorah hill (along with the golden plates), so that the peculiar writing could be translated in the future. Essentially, what this implies is that the Urim and Thummim were a time-travel translation device. Curiously, a certain amount of credibility for this supposition is provided in the Old Testament, most notably in the Book of Exodus. 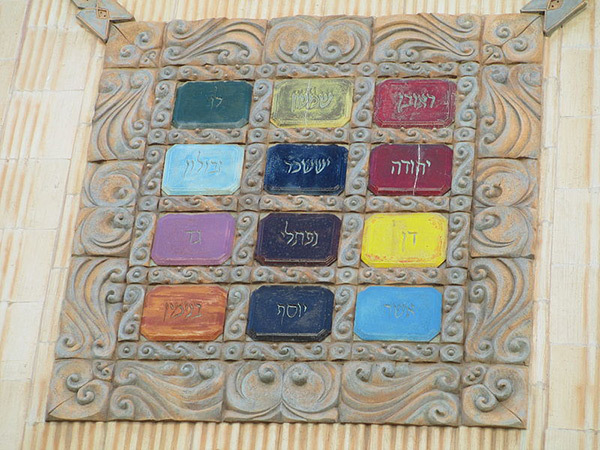 Here, the Urim and Thummim are described as being part of the sacred breastplate worn by the high priest during rituals, such as the famous breastplate of Aaron, brother of Moses, who in the Book of Exodus wears a breastplate adorned with twelve gems, chosen by God to represent the twelve tribes of Israel. Intriguingly, Smith’s mother, Lucy Mack Smith, described the Urim and Thummim as being like ‘two smooth three-cornered diamonds’, and we are told that a diamond was one of the featured gems in the second row of Aaron’s breastplate. Further analysis of biblical scriptures suggests that the Urim symbolised guilt, while the Thummim suggested innocence, implying that their collective purpose was to confirm the authenticity of an issue. There are numerous references to this function, such as that contained in 1 Samuel 14:41, where the Urim and Thummim validate sinners and non-sinners. Were sacred stones objects of divination? It would appear so. The question remains: do we believe that Joseph Smith was in possession of them, or was he merely aware of their existence, given his familiarity with the scriptures. By aid of the seer stone, sentences would appear and were read by the Prophet and written by Martin, and when finished he would say, ‘Written,’ and, if correctly written, that sentence would disappear and another appear in its place, but if not written correctly it remained until corrected, so that the translation was just as it was engraven on the plates, precisely in the language then used. It is important to elaborate on Stevenson, and the other authenticators of the golden tablets, for around this time the tide had begun to turn. On 22 September 1828 Smith reported that the angels had returned the golden plates. 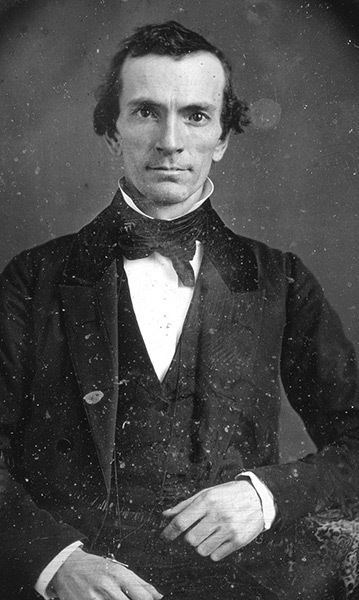 In April of the following year Smith employed a new scribe, a distinguished gentleman by the name of Oliver Cowdery (1806-1850). Smith and Cowdery worked exhaustively on the translation, completing it around 1 July 1829. 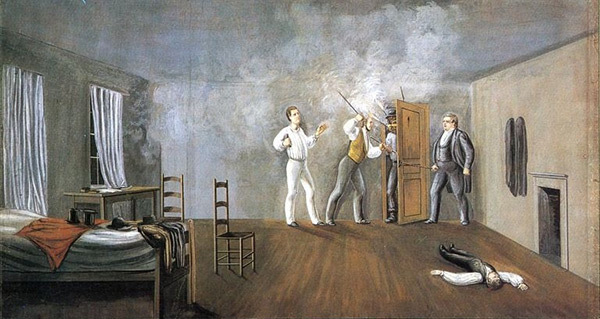 Upon completion Smith claimed that the angel Moroni once again took back the plates, but not before Smith had revealed them to three witnesses – each of whom signed an affidavit stating what they had seen. Stevenson, of course, was one of privileged three. But Smith went further in his attempt to accredit the golden plates, both for his immediate benefit and the future of the LDS. To this end, he allowed another eight men to handle them, bringing the total number of witnesses to eleven. Serendipitously, when we add Smith’s wife Emma to the tally, we arrive at the biblical number twelve, reminiscent of the apostles, religious icons Smith had venerated. Speaking of apostles and high priests, after publication of the Book of Mormon, fame and, predictably, opposition followed, and Smith and Cowdery were forced to flee the region or face the usual consequences of heresy. Perhaps in an attempt to redeem his bruised ego, Smith claimed that the apostles, Peter, James and John, appeared and ordained Cowdery and him high priests. The mystical duo moved to Ohio, where Smith was tarred and feathered and left for dead, before finally settling in Missouri, which both men believed was the ‘New Jerusalem’. Understandably, Smith promptly changed the name of his organisation to the Church of Latter-Day Saints. 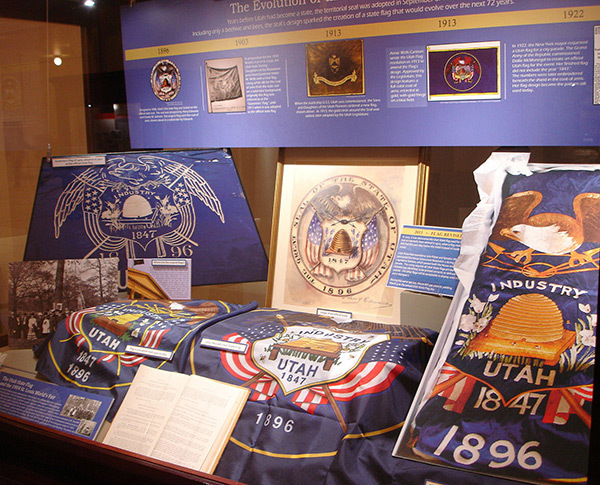 The re-branding did not change his fate, however, and this time wars ensued, including the Mormon War of 1838, which came about due to non-Mormons trying to prevent Mormons from voting. After serving a prison sentence, Smith fled to Illinois, where more violence occurred and where he was eventually shot dead, having been classified as a vigilante. Despite waging all-out war for his beliefs, and practising polygamy and necromancy, Smith is regarded as the most influential ‘religious’ man in the history of the United States (according to Smithsonian Magazine) and is held up as a Moses-like figure by the Mormon faith today. Nevertheless, we are left with more questions than answers. Does the Book of Mormon portray actual historical events? Was it a complete hoax, created by Smith to fuel his ego, and wealth? Or was he actually channelling something real, perhaps a source that yielded unique insights into actual events? The more I probed, the more I was amazed by what the evidence suggested. 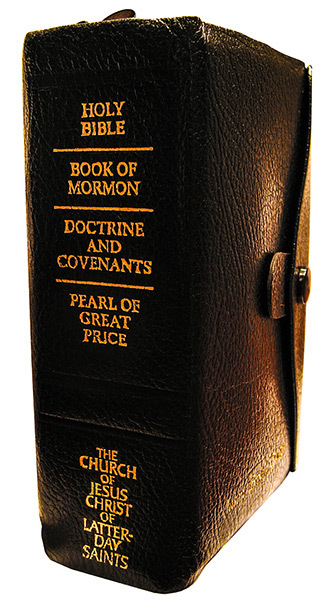 The Pearl of Great Price, which contains the Book of Moses, the Book of Abraham, Joseph Smith – Matthew, Joseph Smith – History, and the Articles of Faith. The documents are fascinating, in particular the Book of Abraham, which highlights the translation skills of Smith once more, for here he rendered a translation from an Egyptian papyrus purchased from a travelling mummy-exhibition. Despite the other important elements contained in the Standard Works, Smith deemed the Book of Mormon the ‘keystone’ of Mormonism, and ‘the most correct of any book on earth’. Why? Most certainly because it contained the history of his ancestors. Let us take a brief look at each of the groups who relocated to the ‘Promised Land’. The groups of people whose lives are chronicled in the Book of Mormon are known as the Nephites, Lamanites, Mulekites and Jaredites, and their accounts are written by prophets such as Mormon and Moroni. 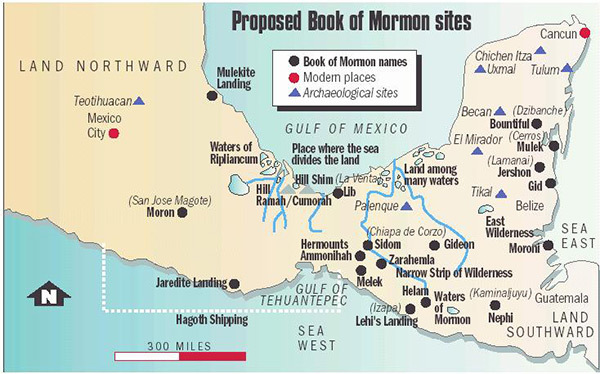 Eventually, each group arrived in the ‘Promised Land’: ninety per cent of the sites referenced in the Book of Mormon appear to place the Promised Land in Mesoamerica, five per cent to ten per cent in South America, and less than one per cent in North America, thus rendering the repeated reference to America being the ‘Promised Land’ a little misleading. So, let us begin with the earliest of voyagers to the Promised Land, the fabled Jaredites. Within the Book of Mormon is the Book of Ether, which records the tale of the Jaredites, written by Moroni as an abridged version of their history. Although it is a later edition to the Book of Mormon, it covers the earliest part of the Book of Mormon chronology. The Book of Ether records how the Jaredites were the descendants of Jared and his brother, who lived at the time of the Tower of Babel, a ziggurat in ancient Sumer (modern-day Iraq). 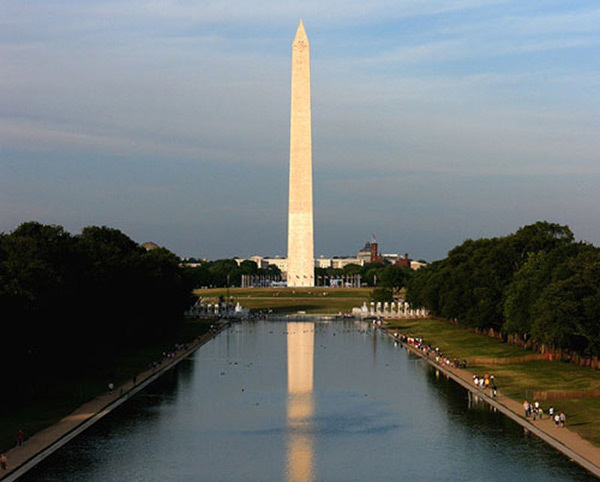 According to the Book of Mormon, the people of this region fled across the ocean on specially constructed barges and established an ancient civilisation in the Americas. Fair enough, but what is truly peculiar is the path they travelled. 2:1 And it came to pass that Jared and his brother, and their families… went down into the valley which was northward, (and the name of the valley was Nimrod). 2:3 And they did also carry with them deseret, which, by interpretation, is a honey bee; and thus they did carry with them swarms of bees, and all manner of that which was upon the face of the land, seeds of every kind. 2:5 And it came to pass that the Lord commanded them that they should go forth into the wilderness, yea, into that quarter where there never had man been. And it came to pass that the Lord did go before them, and did talk with them as he stood in a cloud, and gave directions whither they should travel. 2:6 And it came to pass that they did travel in the wilderness, and did build barges, in which they did cross many waters, being directed continually by the hand of the Lord. 2:7 And the Lord would not suffer that they should stop beyond the sea in the wilderness, but he would that they should come forth even unto the land of promise, which was choice above all other lands, which the Lord God had preserved for a righteous people. 2:13 And now I proceed with my record; for behold, it came to pass that the Lord did bring Jared and his brethren forth even to that great sea which divideth the lands. And as they came to the sea they pitched their tents; and they called the name of the place Moriancumer; and they dwelt in tents, and dwelt in tents upon the seashore for the space of four years. 2:16 And it came to pass that the brother of Jared did go to work, and also his brethren, and built barges after the manner which they had built, according to the instructions of the Lord. And they were small, and they were light upon the water. Given that Egypt, Turkey, Israel and most areas in the vicinity were relatively populated at the time, Allen (and many other LDS historians) concludes that the Jaredites must have travelled in a different direction. Nevertheless, Allen examines the routes they intuitively should have taken, such as travelling on the Euphrates, Black Sea, Mediterranean and Red Sea, before concluding that there was no more viable candidate for ‘where there never had man been’ than the route through Asia and Mongolia, to the borders of the Pacific Ocean of China, from where many LDS scholars believe the Jaredites departed for the Promised Land. Allen defends his supposition with references from the Book of Mormon that state that the Jaredites travelled for four years in the wilderness before voyaging a great distance by water – 344 days to be precise, a duration far greater than the crossing to Mesoamerica via the Atlantic Ocean or, as Moroni calls it, ‘that great sea which divideth the lands.’ Allen concludes that the Jaredites set sail for nearly a year on the Pacific Ocean. Supporting Allen’s claim, it takes two to four months to cross the Atlantic Ocean from Morocco to Veracruz, Mexico, in non-modern boats, and the explorer, Thor Heyerdahl, made the trip on an ancient-styled raft, from Morocco to the Caribbean, in just two months. So, a period of 344 days on water seems excessive for an Atlantic crossing, especially as the Book of Ether states ‘… the wind did never cease to blow towards the promised land… ’ (Ether 6:8). Thus, unless the Jaredites got hopelessly lost, their 344-day ocean journey strongly suggests a Pacific Ocean crossing, a journey that is at least twice as long as an Atlantic Ocean voyage. They came to this land (Mexico), having first crossed many lands and waters, living in caves and passing through great tribulations (Ixtlilxóchitl: 8). The ancestors of the natives of this land that is now called New Spain, according to the common and general opinion of everyone, as well as that which appears demonstrated in their paintings, came from Occidental areas . . . All the people in this land boast and affirm that they are descendants of the Chichimecas. The reason, according to their history, is that their first king, whose name was Chichimecatl, was the one who brought them to this new land where they settled. And it was he, as can be deduced, that came from the great Tartary, and was part of those who came from the Division of Babel (Ixtlilxóchitl:20-21). Readers will note that Tartary (Latin: Tartaria) was a medieval term used to describe the great tract of northern and central Asia, stretching from the Caspian Sea to the Pacific Ocean. What is more, it was inhabited by the Turkic peoples after the Mongol-Turkic invasion, and these are the people who many claim to have been the ancestors of the Olmecs. Further, many believe that the Jaredites were the Olmecs, or at least became the Olmecs, once they had colonised in Mesoamerica. Also of note, Chichimeca was the name that Mexican peoples used to denote the same meaning as the European term ‘barbarian’. The evidence suggests that the Jaredites later become the Olmecs, and multiple sources confirm that they came from the land of a great tower, and travelled to Mesoamerica via the Pacific Ocean. It has been reported that they (the Jaredites – after arriving in Mesoamerica) wandered for 104 years in different parts of the land until they settled in Huehue Tlapallan (the Mexican Gulf Coast), their homeland. This was in the year Ce Techptal and 520 years had elapsed since the flood (Ixtlilxóchitl:9). LDS scholars place the arrival of the Jaredites in Mexico at circa 2698 BCE. This is derived by subtracting the 104 years of wandering from the 520 years of elapsed time after the flood, assuming that the flood occurred on 14 August 3114 BCE. Given that the Jaredites took an entire year to cross the ocean, we arrive at an arrival date in Mexico of approximately 2700 BCE. Allen adds, ‘In summary, the Jaredites lived in a region called Moron during the administration of the first five kings, who were known as Jared, Orihah, Kib, Shule and Omer.’ Intriguingly, we are told that the prophet Moroni abridged Ether’s Jaredite record (Ether 1:2) and gave ‘not the full account, but a part of the account . . . from the tower down until they were destroyed’ (Ether 1:5). Just why the prophet Moron condensed the account is unclear. Before leaving the Jaredites’ journey for a moment, it is worth highlighting an archaeological breadcrumb in South Arabia that is but three miles from where LDS scholars believe the Jaredites set sail for the Promised Land. I speak of beehives. Surely, one would not expect the Jaredites to travel across vast oceans in small boats with bees, but having been forced to survive in the desolated wilderness for four years prior to their departure, the Jaredites must certainly have made use of the bee and its many bountiful by-products, such as honey, for medicinal purposes if nothing else. Serendipitously, or perhaps as a result of travelling with bees, the region where the Jaredites departed to the Promised Land was called Bountiful. It is fascinating to discover that a short distance from where the Jaredites built their boats, in the caves above Khor Rori, in Oman, we find the remnants of beekeeping; an extensive collection of beehives and what appears to have been an ancient apiary that flourished until the twentieth century. These hives remain the only testament to bees (wild or otherwise) that existed around this time in this region. Might the beehives in Oman be archaeological evidence of the Jaredites’ journey from Mesopotamia to the Promised Land, with bees? 17-1 Nephi And it came to pass that we did again take our journey in the wilderness; and we did travel nearly eastward from that time forth. And we did travel and wade through much affliction in the wilderness; and our women did bear children in the wilderness. 17-4 And we did sojourn for the space of many years, yea, even eight years in the wilderness. 17-5 And we did come to the land which we called Bountiful, because of its much fruit and also wild honey; and all these things were prepared of the Lord that we might not perish. And we beheld the sea, which we called Irreantum, which, being interpreted, is many waters. 17-6 And it came to pass that we did pitch our tents by the seashore; and notwithstanding we had suffered many afflictions and much difficulty, yea, even so much that we cannot write them all, we were exceedingly rejoiced when we came to the seashore; and we called the place Bountiful, because of its much fruit. And so the weary travellers stumbled upon a remarkable oasis in the wilderness, with fruit and many other byproducts of bees, including honey; a bounty that had been left by their ancestors, the Jaredites, over ten centuries earlier. Lehi’s colony, the Nephites, arrived in Mexico in what LDS scholars estimate to be 586 BCE. Like the Jaredites, some 2,000 years before them, they landed on the western side, near the modern Mexican border with Guatemala, and were regarded as the record keepers of the Book of Mormon. Then came the Lamanites, which the Book of Mormon portrays as dark-skinned, wicked rivals to the lighter-skinned, righteous Nephites, both of whom are portrayed as descendants of the Israelites, and who travelled to the Promised Land around the same time as the Nephites, circa 600 BCE. The Mulekites were another tribe that journeyed from Jerusalem to the Promised Land, landing on the Gulf side of Mexico, a little later than the rest, circa 575 BCE. Curiously, the Mulekites spoke a language largely unintelligible to the Nephites. 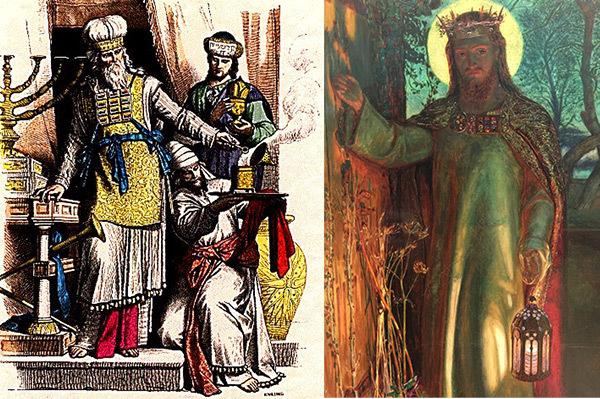 According to the Book of Mormon, a prophet by the name of Mosiah led the Nephites from the land of Nephi to Zarahemla, now Chiapas, Mexico, and was later appointed king. Legend recalls that a large stone was brought to King Mosiah that recounted the first inhabitants of the region and explained how their language had been corrupted at the Tower of Babel. 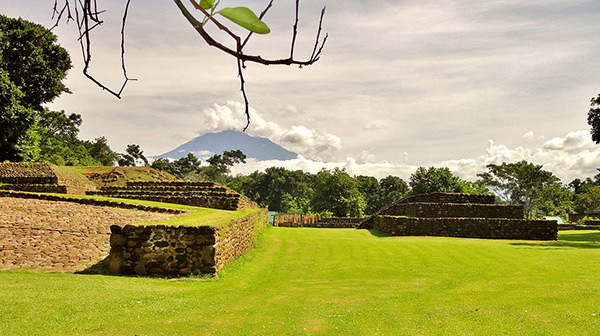 Later, in 121 BCE, an expedition set out to find the stone, failed, but instead discovered the remnants of the Jaredites, including twenty-four plates of gold, which they took back to the land of Nephi, on the eastern shore of Guatemala. Here, the grandson of King Mosiah translated the twenty-four gold plates. Over five hundred years later Moroni, the son of Mormon, abridged the translation into the Book of Mormon. Again, the reason for prophet Moroni condensing the twenty-four gold plates is not clear. While neither a Mesoamerican scholar nor a student of the LDS, I believe that there are descriptions of events and places in the Book of Mormon that, despite the book’s unfathomable origin, warrant further consideration. To that end, I believe the following elements of the story are worthy of historical consideration. The Jaredites departed Mesopotamia with bees, and wild hives are discovered in the vicinity of their departure point, in South Arabia, where no bees were domesticated at the time. Further, the alleged path of the Jaredites, ‘where no man was’, appears to wind through Mongolia and China, whose people have been cited by experts as bearing a strong physical resemblance to the giant Olmec heads found all around the classical Olmec region, near the gulf, on the north-east coast of Mexico. Also of note, the suggestion that the Jaredites arrived in Mexico from the west, and that their subsequent migration was north, mirrors archaeological evidence and timelines associated with the Olmecs, that is the Jaredites and Olmecs rise and fall at roughly the same time, and archaeological evidence confirms that the Olmecs first settled where the Book of Mormon says the Jaredites arrived, on the west coast, before migrating to their traditional region around La Venta. Then we have Izapa, Mexico. This is where Lehi’s colony from Jerusalem landed, but apparently it is also where the early Olmecs travelled after they (the Jaredites) arrived on the west coast, in the Land of Moron, in the region of modern Oaxaca. 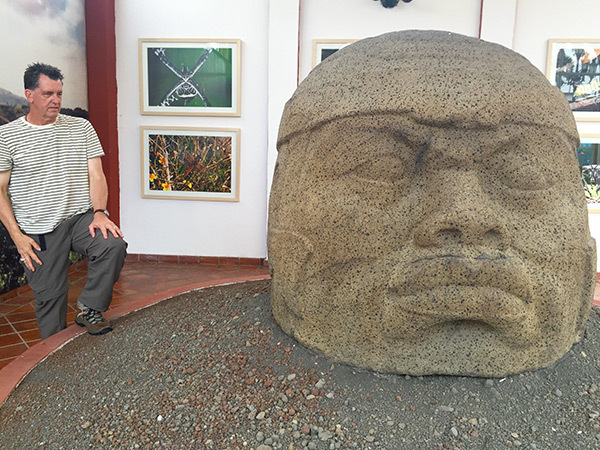 What is fascinating about this settlement is that it is where the Mayan calendar originates – and one of the core frameworks of that calendar is what is known as the Long Count, a system that is now regarded as Olmec in origin, not Mayan. 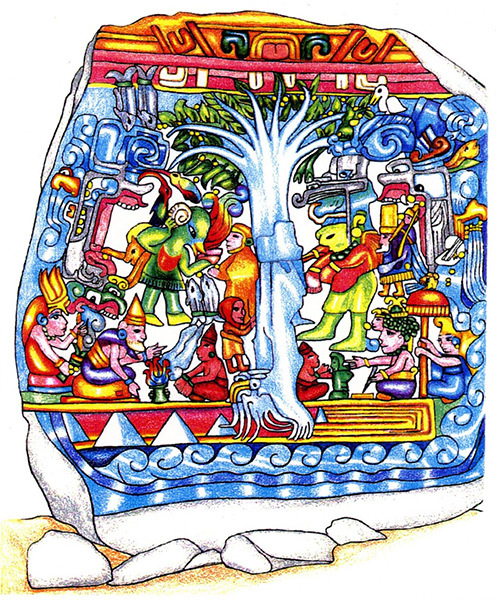 Further, Izapa is where LDS scholars claim to have identified what they consider to be the most important archaeological find in the Book of Mormon, Izapa Stela 5, the tree of life, a relief that, they argue, portrays Lehi’s vision of the tree of life. 8:2 And it came to pass that while my father tarried in the wilderness he spake unto us, saying: Behold, I have dreamed a dream; or, in other words, I have seen a vision. 8:3 And behold, because of the thing which I have seen, I have reason to rejoice in the Lord because of Nephi and also of Sam; for I have reason to suppose that they, and also many of their seed, will be saved. 8:4 But behold, Laman and Lemuel, I fear exceedingly because of you; for behold, me thought I saw in my dream, a dark and dreary wilderness. 8:5 And it came to pass that I saw a man, and he was dressed in a white robe; and he came and stood before me. 8:6 And it came to pass that he spake unto me, and bade me follow him. 8:7 And it came to pass that as I followed him I beheld myself that I was in a dark and dreary waste. 8:8 And after I had travelled for the space of many hours in darkness, I began to pray unto the Lord that he would have mercy on me, according to the multitude of his tender mercies. 8:9 And it came to pass after I had prayed unto the Lord I beheld a large and spacious field. 8:10 And it came to pass that I beheld a tree, whose fruit was desirable to make one happy. Clearly, to the uninitiated, the text is ambiguous to say the least. However, the vision is widely believed by LDS scholars to be a silver bullet and, not surprisingly, Allen dedicates ten A4-sized pages in his book to the analysis. Mind you, the relief is extremely popular among other, non-LDS scholars and pre-Columbian contact theorists, such as Ivan van Sertima, who interprets the stela as supporting an African origin of the Olmecs. 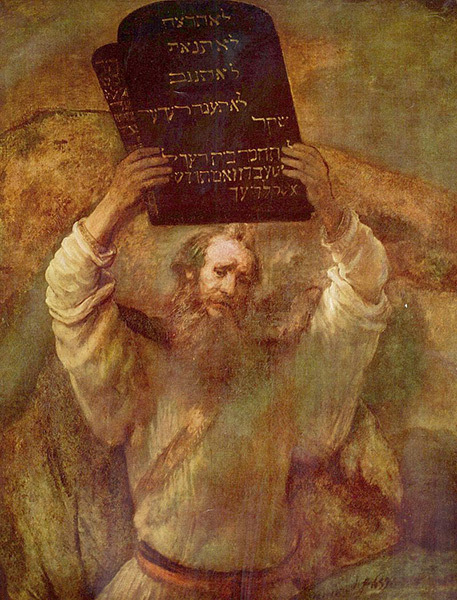 Suffice it to say, most dismiss the notion that Lehi’s vision is portrayed on Stela 5, choosing to shelve the comparison as an example of religious bias and wishful thinking. Despite the ambiguity of Stela 5, Izapa provides another, far less heralded relief; one that I believe goes a long way to suggesting, if not confirming, pre-Columbian trans-oceanic contact. I speak of Izapa Stela 2, a relief that I have identified as portraying a variant on the famous bull-leaping ritual from the Aegean and the Middle East. Like most reliefs, the meaning of Stela 2 is uncertain; that is, there is no text describing the images in the relief, only educated conjecture by scholars. Thus, the consensus is that Stela 2 portrays the battle of the Maya hero twins against Vucub Caquix, a powerful ruling bird-demon of the Maya underworld, also known as Seven Macaw. 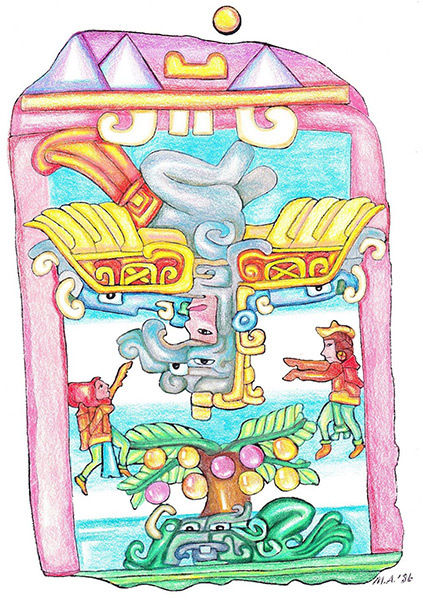 The Maya hero twins are the central figures of a narrative included in the Popol Vuh (meaning ‘Book of the People’), a curious collection of mytho-historical narratives of the Post Classic K’iche’ kingdom in Guatemala’s western highlands, and their story remains the oldest Maya myth to have been preserved in its entirety. In the K’iche’ language, the twins were named Hunahpu and Xbalanque and appear frequently in the art of the classical Maya (AD 200-900). The essence of the story is that the twins, were ballplayers like their father and uncle, Hun Hunahpu and Vucub Hunahpu, who were defeated and sacrificed by the lords of the Underworld. Nevertheless, the twins were conceived by the seed of their dead father. The pregnant mother fled and the twins grew up to avenge their father’s death, for after many attempts they defeated the lords of the Underworld in the ballgame. Many Native American cultures in the United States also feature a tradition of two male hero twins, suggesting it may be an archetype of sorts. And while I am not qualified to cite examples in LDS literature that mirror the hero-twin mythology, I can share that I have noticed a great similarity between Izapa Stela 2 and the conventional bull-leaping motif portrayed in Minoan Crete. The bull-leaping ritual is fascinating, and while I am diluting its significance by merely touching on it here, I shall do my best to explain its relevance and will promise to delve deeper another day. Both reliefs show what appears to be a sporting event, with androgynous figures on either side of the bull or, in the case of Stela 2, what I have identified not as a bull, but as the Mayan bee-god, Ah-Muzen-Cab, who is being flipped in the air and is upside down. Beneath the bee-god is a tree with disproportionately large fruit. Or might they be wild beehives? In Crete, where the classic bull-leaping image is from, images of trees with wild-honey hives just like this have been identified on numerous signets and rings, and so the notion that the ‘large fruit’ is actually wild beehives should not be dismissed out of hand. 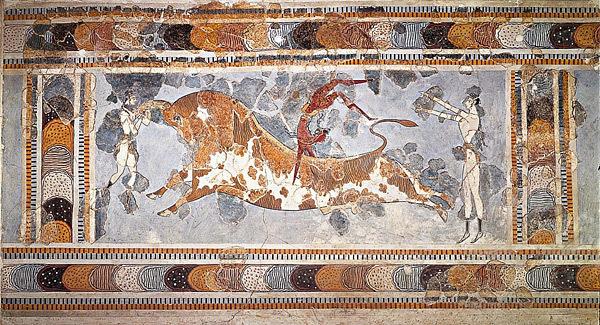 Further, the bull-leaping motif is ancient, and if we exclude the prehistoric images found in the caves of Spain and France (images that depict bulls with stick-like human figures floating around them), the frescos that served as the precursors to the famous bull-leaping ritual we find in Knossos originated in Syria, then Avaris, Egypt, before arriving in Crete. Due to the distinctive water-/wave-like frame of the Knossos Bull-Leaping Fresco (a technique that was used on the mainland for but a brief time), scholars have been able to date the fresco to the period between the first and third (final) eruption (1200 to 1100 BCE) of Thera (dating according to the historian and chronologist, David Rohl), thus suggesting what I feel to be an offering image; symbolism that was created to ward off a real and present danger by asking for mercy from the omnipresent gods of nature and war. Further evidence for this theory will be forthcoming, for I have already strayed from the subject at hand, but suffice it to say that Stela 2 appears to represent pre-Columbian contact between Mesoamerica and great civilisations that had flourished, but an ocean away. Maybe one day a LDS scholar will find a link between the Book of Mormon and Stela 2 from Izapa, the settlement where the classical Maya culture was born, where the Mayan calendar was created, where an earlier Olmec culture was based, and where the colony of Lehi was said to have landed on their voyage from the old world, at the dawn of the Maya civilisation. We must remember that Crete is where the remarkable Phaistos Disc originated, dating from 2000 BCE, and which is believed to be a sophisticated calendar. Was the Phaistos Disc the precursor to the Mayan calendar? Was it brought to Mesoamerica by white, bearded, Cretan priests – Viracocha figures, who were leaving Atlantis before the third and final eruption of Thera and travelling with the gods of the wind, with knowledge of Venus (known throughout Mesoamerica as a bee-god that saved humankind), of the arts, and the knowledge of time-keeping? Might these travellers have intermixed with the Jaredites to infuse into the Olmecs the knowledge of the most heralded ancient culture in history? It remains an intriguing thought. My intent in featuring both the unlikely personal journey of Joseph Smith and his tales of the epic travellers in the Book of Mormon, is not to invalidate or disrespect him, or the LDS, in any way. I do not believe that Joseph Smith was mad, although he may have been delusional. What I do believe is that he was an extraordinary and learned man, and someone who epitomised the social influences of his time. This article has been an attempt to sift through the hype, history and hoaxes, without prejudice. When one does that, Joseph Smith emerges as one of the most notable religious figures in American history, one that LDS followers consider to be a modern-day Moses. And to be fair, the Moses comparison is not unwarranted, for each ‘prophet’ was given tablets inscribed with sacred writings that were written and presented by supernatural beings. While billions of believers acknowledge the ‘reality’ of Moses’s tablets (an equally sensational story known as the Ten Commandments), the story of Joseph Smith’s golden tablets remains a source of ridicule. To be fair, perhaps both accounts deserve our critical scorn. 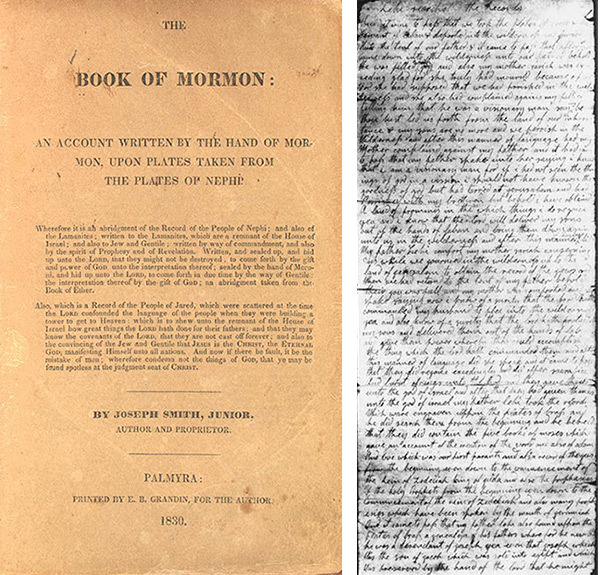 The accuracy of the content that Joseph Smith transcribed in the Book of Mormon, however, is seriously called into further question when one recalls the story behind his channelling of the Book of Abraham, which was part of the Standard Works, and contained in the Pearl of Great Price. Smith transcribed the essence of the Book of Abraham in 1835, only this time he was not translating golden plates, but rather an Egyptian papyrus which had been purchased from a travelling mummy-exhibition. Smith translated the Egyptian text, and its images, thirty-six years after the discovery of the Rosetta Stone (1799), but only fifteen years or so after the language of Egyptian hieroglyphics was understood by more than just a handful of experts. Smith’s highly detailed translation contains many fascinating elements, descriptions of events, and details, such as bees being transported from Mesopotamia into the Eastern Egyptian Desert – the domain of the Egyptian God Min, the Master of the Wild Bees. While I wish that this and other aspects of the Book of Abraham were true, it appears to be either an elaborate hoax, or perhaps an enthusiastic channelling of erroneous information that Smith believed to be true. In 1966, over a century after his death, Smith’s missing Egyptian papyri were found in the Metropolitan Museum of Art, in New York City. The discovery was a revelation, as it had been believed that the papyri had been destroyed in 1871 in the Great Chicago Fire. In fact, they had been acquired by the museum from its then owner, after decades of being handed down between relatives and friends. For the Book of Breathings is before all else, as Bonnet observes, a composite, made up of ‘compilations and excerpts from older funerary sources and mortuary formulas.’ From the Second Book of Breathings, hardly distinguishable from it, it blends off into such earlier writings as ‘The Book of Passing through the Eternities’, the ‘Amduat’, and the ‘Book of Gates’, in which we recognise most of the ideas and even phrases of the ‘Sensen’ Papyrus [the original name given to fragments of the papyri that Smith translated into the Book of Abraham]. We have seen that Smith was in good company in translating documents provided by otherworldly beings, for Moses had done the same. However, there are other examples in modern times, such as the Metal Library of South America, an alleged collection of books written on metal and crystal tablets, complete with unusual, allegedly Egyptian-styled writing, and which has been associated with the famed gold of Eldorado, a treasure hoard that those closest to the story believe to remain hidden beneath a river in the Tayos cave system in Ecuador. The truth is, over the years there have been many tales of gold plates with strange writing inscribed on them, just like Joseph Smith’s tablets. However, the practice of ancient texts being written on blocks of stone is entirely normal, and one needs look no further than the countless stone etchings, such as the ancient Sumerian cuneiform tablets, which can be found in museums all around the world. In fact, the most incredible story of the Old Testament, the story of Noah and the ark, was never taken seriously until a cuneiform text was translated by a pioneering Assyriologist by the name of George Smith (1840–1876), who visited the British Museum on his daily lunch break and attempted to transcribe the ancient tablets. 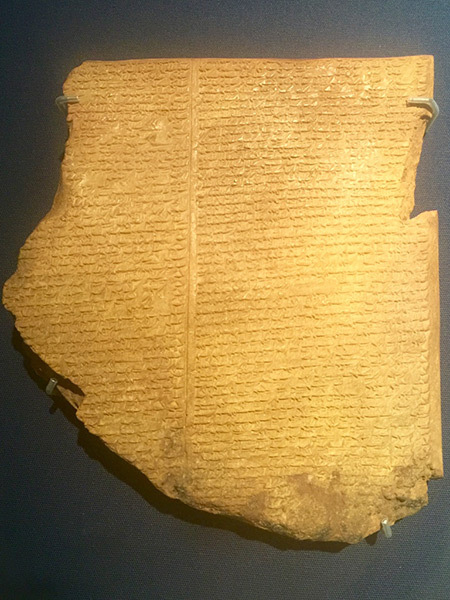 Eyewitness accounts claim that he took his clothes off and ran around naked at the excitement of having realised that the text on the baked clay tablet inscribed with the Babylonian account of the flood was not only identical to the flood story in the Old Testament, it was the eleventh tablet of the Epic of Gilgamesh, a real historical king. 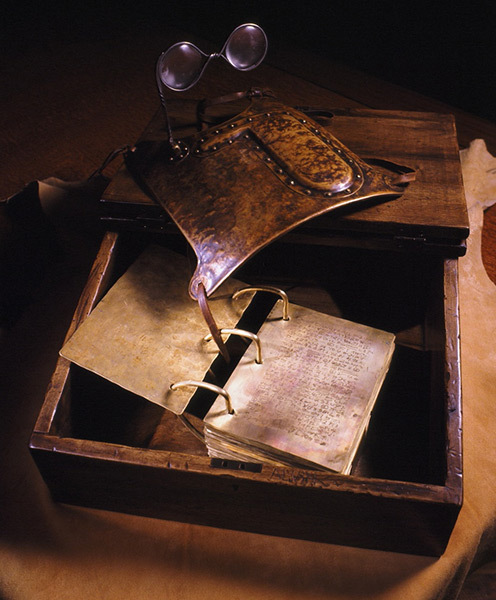 However, in the case of Joseph Smith, what we are really calling out is the mechanism by which the purported tablets ended up in his possession, whether they existed at all and, of course, the manner in which he translated them into the Book of Mormon. 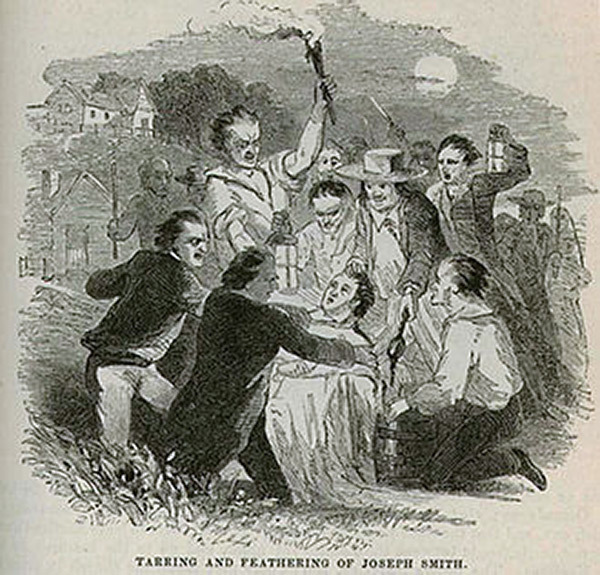 One possibility is that Smith discovered, stole or otherwise unscrupulously came into possession of ancient tablets that were legitimate historical artifacts and, in order to bolster his personal wealth and power, and to ensure they were accepted in the context of the extreme religious zeal of his day, he invented the story of the angel to both protect his source and to facilitate faster and broader acceptance amongst the religious community. The possibility is unlikely. However, if it were true, then one would expect to find historically collaborative information in the Book of Mormon. The question remains, have we? After its founder’s death, Mormonism was nurtured by Brigham Young (1801–1877), who succeeded Smith as president of the LDS and moved it west, to less hostile regions, and founded Salt Lake City, then part of Mexico, and the university that would later bear his name. Like Smith, Young waged wars, was a polygamist who fathered fifty-seven children by more than two dozen wives, and was regarded as the American Moses. Young’s primary residence in Salt Lake City was called the Beehive House, and it derived its name from a beehive sculpture, representing industry, he had commissioned for the roof. In fact, as the first governor of the region, Young wanted to name the territory ‘Deseret’, the Jaredite word for ‘honey bee’. However, the United States government chose to name the state Utah, after the Ute Indians, though the beehive was later incorporated into the state’s official emblem. Symbols of bees are everywhere in Salt Lake City, but few recall that their inspiration came not from industry, but from the founding forefathers of Mesoamerica, who had travelled for a year across the ocean, to a place they called the Promised Land. The honey bee is not a native of our country. Marcgrave, indeed, mentions a species of honey bee in Brazil. But this has no sting, and is therefore different from the one we have, which resembles perfectly that of Europe. The Indians concur with us in the tradition that it was brought from Europe, but when and by whom we know not. The bees have generally extended themselves into the country a little in advance of the settlers. Jefferson’s theory that the American honey bee came from Europe is intriguing and supports the Mormon legend of the Jaredites’ migration to Mesoamerica – possibly with bees. Prior to Jefferson, the American statesman, Benjamin Franklin (1706–1790), was a known patron of Thomas Wildman’s Treatise on the Management of Bees (1768). Even President and Freemason, George Washington (1732–1799), understood the symbolism of the bee and featured a beehive on his masonic apron. At first, the dedication seems peculiar, for it stipulates that the United States of America is founded on and dedicated to the bee – Deseret is honey bee in the Jaredite language. But what it is really saying is that the region once founded by Brigham Young took so much pride in its Jaredite heritage that it extended its good wishes to God (the Lord) with the signature and symbol of its western region, the bee. 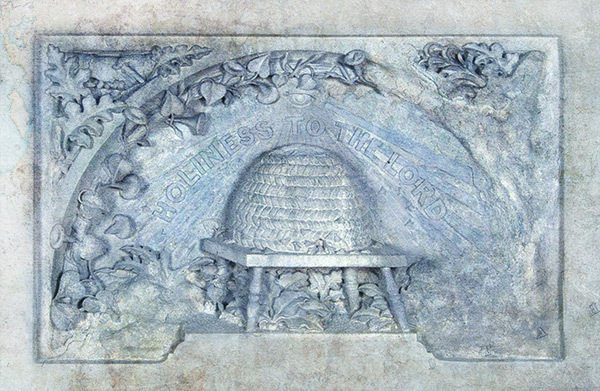 Real or imagined, the Book of Mormon succeeded in entwining the traditions and symbolism of the bee into the psyche of the then young nation, albeit an association that has been forgotten, even if it has been inscribed in stone.